From the Oconee River Bridge on Sparta Highway, go 9 miles to Carrs Station Rd. Turn left. Go 6.8 miles to Lake Sinclair Rd. Turn right. Go 3.9 miles to Island Creek Dr. Turn left. Go 2.9 miles to Ridge Rd. Turn right. Go 0.2 mile to Erinshores Dr. Turn left. Go 0.2 mile, turn left at a metal gate (numbered 3). Go 0.4 miles on logging road. 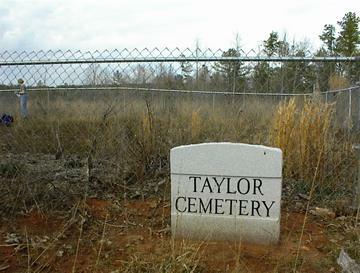 Cemetery is on the left within a chain link fence. No marked graves. All information is per Taylor descendants. One grave marked by an octagonal sidewalk stone. Two graves marked by fieldstone headstone and footstone. Scattered bricks marking other graves. Small clump of flowering daffodils can be seen in spring. All info per Taylor family. s/o Walter Taylor. Died in his teens. All info per Taylor family. d. between 1888 and 1891. Lived about 5 days All info per Taylor family.